I've used a similar spreadsheet for years. One thing I do differently is that I put the ages of the parents in a separate column, then in another column, calculate their estimated date of birth using a formula subtracting the age column for the document year column. Doh! Now I have to add a few more columns, but I love this idea. Thanks for your post. I did something similar for the Antenati records for families from Montecorvino Rovella that might be related to me. It's available at https://docs.google.com/spreadsheets/d/1-cGuBVdQaNva3EZWBQQag5yu3uxUxaQtR3cv6UG2dVE/edit?usp=sharing. I added different worksheets for the different types of records: Napolenico, Restaurazione, and Civile with the Nati, Morti, and Matrimoni records on separate worksheets. 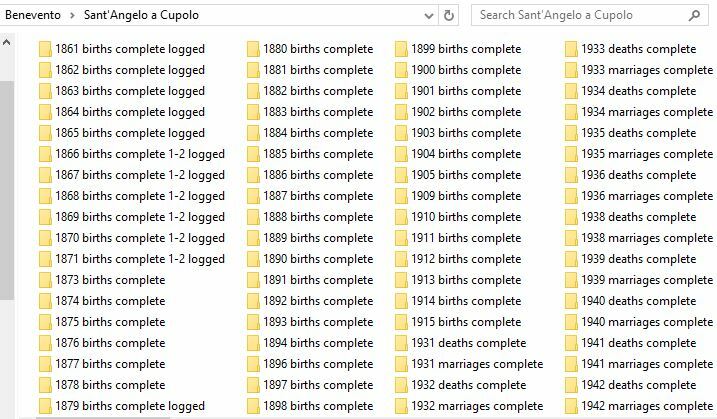 It may be helpful for people researching families such as Vassallo, Conte, Salerno, Lupo, Leo, Trezza, Marmora, Di Vece, Chieffo, Buoninfante, etc. I salute your ambition and determination! I think it will pay big dividends for you. On FamilySearch, do you ever use the Export Results button when you're viewing the list of records that a search has returned? I confess that I haven't -- but SHOULD -- for downloading an XLS spreadsheet of the results. It wouldn't have the exact same columns that you use, but I think you could use it as a skeleton and add in the additional columns. I keep meaning to use the feature to create a checklist of records that I need to view and then add my comments about what I found. Maybe today I shall! Thanks, Marian! That sounds like a good tip. As a long-time Ancestry.com subscriber, I've barely scratched the surface with FamilySearch, but it looks like it's gotten better and better. Hi, Marian. Yes, anyone who's interested in family history would be crazy not to have a FamilySearch free membership. 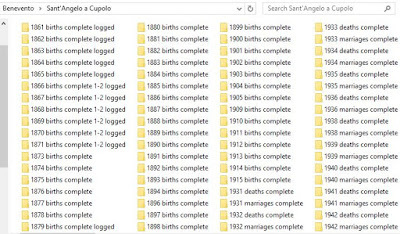 I have downloaded all available records from Sant'Angelo a Cupolo and its hamlet, Pastene, from the free Antenati website. I'm only lately getting into the habit of checking FamilySearch, too. If doing research other than Italian, does this report (and others listed) work? Absolutely! My articles give mainly Italian examples because my ancestry is all Italian. But Family Tree Analyzer (http://ftanalyzer.com) uses the genealogy GEDCOM standard to help you improve your family tree in many ways.